So we have a solar eclipse in Pisces. There's so much going on with this new moon eclipse but before I go into looking into this vibration in more depth I want to take a minute to shout out all you dreamy Pisceans out there. If there was ever a time for you to delve into the depths of your imagination, where your dreams live and pull them through to make them a reality, it would be NOW. But wait! There are a few things that should be addressed first and it stems beyond what you think you want and more in alignment of what you really need. 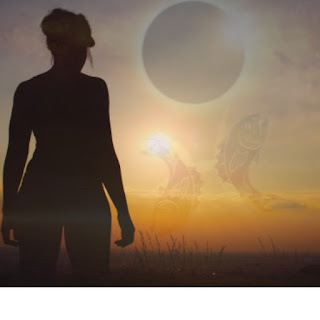 Solar eclipses are represented by the sun and the moon conjoined together in the sky renewing the electromagnetic vibrational frequency of the earth. Yes we should take a minute to say Thank You! Not only are the sun and moon together again but we have Neptune (Visions) Chiron (healing) and Mercury (thoughts) also joining in on this celestial party of Renewal. programs we have built up about ourselves stored in the subconscious parts of our minds, being projected out consistently as our truth. Pisces is the last star constellation before we start off the Spring New Year, which also carries the theme of endings and new beginnings. These new beginnings are almost fated. Like when you think you really WANT something but the universe keeps conspiring to give you exactly what you NEED. That's unconditional love right there. There's a level of healing that needs to take place before we can delve deep into our unlimited potential. In order to do so we need to restore that love within the self first, find our truth and don't be afraid to live by it. This eclipse has everything to do with how we love on a higher universal unconditional level. Divine love that is. That unconditional love that allows your heart to pump nearly 2000 gallons of blood around the body every single day without a please or thank you. That type of love that does without acknowledgment. That's that Piscean love. The highest octave of Venus. Eclipses usually have a 3 – 6 month effect on our consciousness before they even set in and could last up to a year. The energy emitted around this time is long lasting and has substantial influence on the areas that are being highlighted either just before the eclipse or just after by way of an event. What has been the theme up until this point? Lets take it back betweeen 7 – 10 days prior to today. Or even looking back at the events of the lunar eclipse earlier this month. In answering that question you will have insight into what the universe is conspiring for you to take a further look into to work through in order to shed it's light on new beginnings. The key here is not to fear letting go, not to fear the unknown and building healthy boundaries for self first. In doing so we could potentially miss out on great opportunities. Think Big! Think New! Set new Intentions for yourself and most importantly move into the direction of your imagination and express your dreams. There are so many things we can do. You can taste you can touch you can make moves. I can show you who you are. I see you so much higher. It’s time to grow baby. It’s all perception my love. All is how we read it. And the All is of me.